A disused iron factory in Copenhagen's Nørrebro neighbourhood provides the new home for the Brus Brewery, which features a bar, shop and restaurant, all dominated by oak. The Brus Brewery – named after the Danish word for the fizziness liquid obtains when carbonated – is located inside a 750 square-metre building. 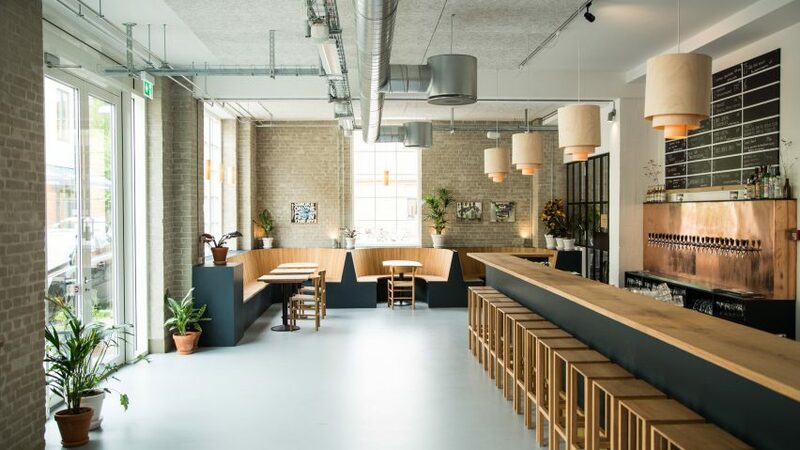 The owners, Danish craft brewery To Øl, created the interiors themselves. The team wanted to make sure that the space was designed for function first and aesthetics second. "The brewery isn't specially designed for being on display for the guests and visitors, and is located at the back of the house in all its steel and glory," they said. "Everything is there for a function – the oak barrels are not there for aesthetic reasons but for ageing beers." Oak was chosen as the main material throughout the space, matching the barrels. Local carpenters and furniture designers were brought on board to create tables and seating, which they did using three whole oak trees. The oak trees provided a nine-metre-long bar, as well as the lounge booths, bar stools and restaurant tables. "The oak carries an inherent reference to the barrels but stands alone as a beautiful type of wood," said the studio. "It is merely treated with oil and is present in its most pure form." A lounge area towards the end of the bar features curving benches, with backrests in the shape of barrels and seats made from cork. The J39 and Søborg chairs by Danish architect Børge Mogensen also provide visitors with somewhere to sit, and are made from oak to correspond with the rest of the brewery. Wooden pendants are used to light up the bar and window areas, while spotlights focus on the greenery and beer menus. Aiming to create an open-plan space, the owners opted to keep walls to a minimum, using them only to enclose toilets and small stock rooms. The building's original construction is revealed through its exposed brickwork and ceiling structure, where a robust ventilation system is also left uncovered. Fleet Architects similarly transformed a "concrete shell" in east London into a craft beer house.